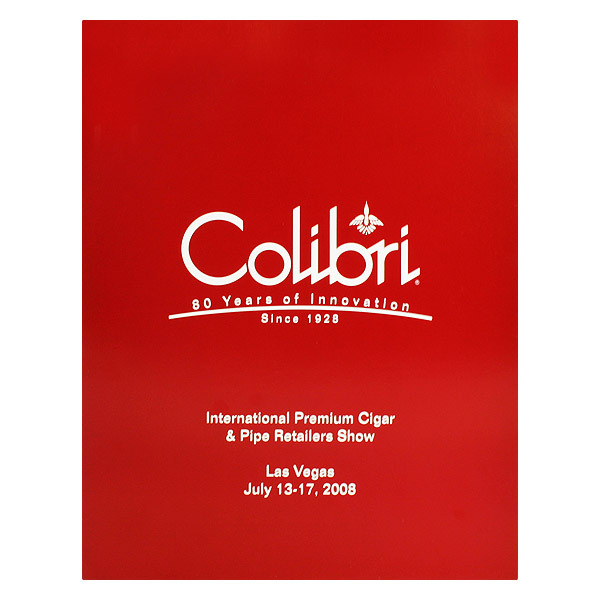 Colibri's commemorative 80th anniversary design stars the brand's logo, which hints at Depression Era art deco style as a throwback to the company's founding in 1928. The brilliant red attracts the eye and pumps energy into the design. To balance out the red cover's sense of desire and intensity, two white interior panels create space and relax the eye. The matching red photo frame brings a pop of color to the interior, where recipients can place photos of themselves enjoying the brand's smoking accessories and tobacco-related gifts. 1 foil stamped area on Side 1 of uncoated 80lb New Black Felt stock. 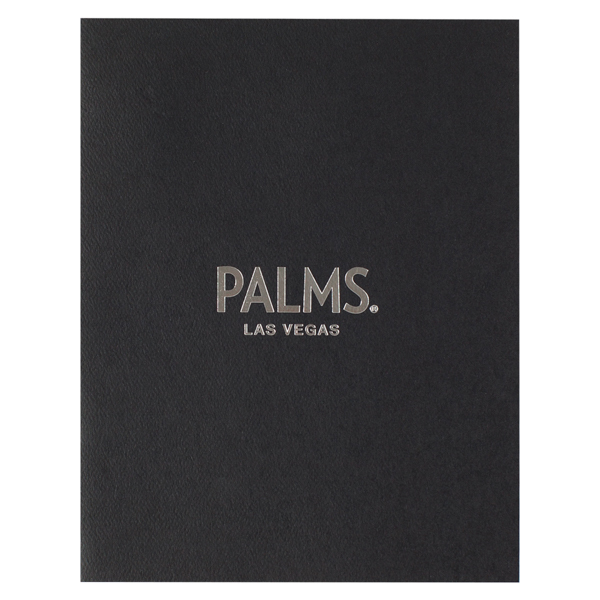 Famed for extravagant pools and restaurants, Palms Casino Resort skipped the typical flashy photos of Las Vegas. Instead, its black panels allude to the metropolis' thriving nightlife and let viewers paint the night as they imagine. The Metallic Silver logo flashes with reflected light, bringing in a tantalizing taste of the city's glamour without overruling the design's simplicity. Side 1 printed with 1 PMS color using heavy coverage. 12pt C1S Semi-Gloss stock coated with Aqueous Matte. 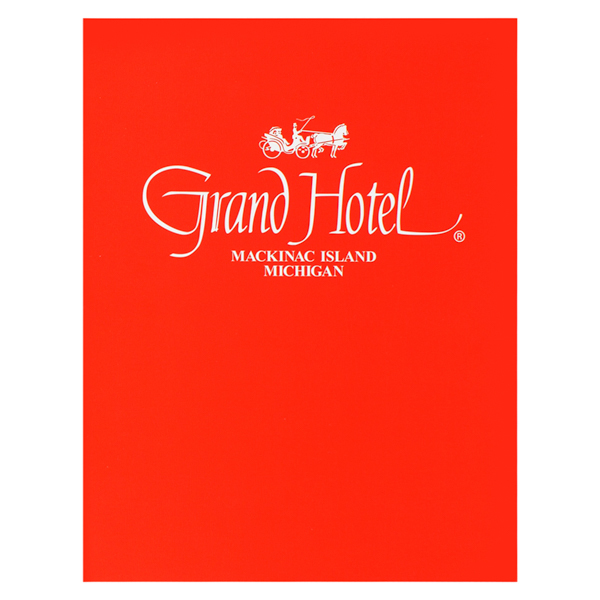 Visitors can commemorate their stay on Mackinac Island with this bright red photo folder. The Grand Hotel's horse drawn carriage logo is a nod to the rule that only horses and bicycles be used on the island. The matching red frame draws viewers' gazes straight to the right panel. A decorative deckle cut and a white band encircling the photo create texture with a layered look. Side 1 printed with 1 PMS color using light coverage. 100lb Dark Blue Linen stock uncoated. White ink on navy blue panels gives the White House Communications Agency a look that's both professional and patriotic. The elegant stock's linen texture conveys sophistication. Directly centered on the cover, the WHCA seal likewise gives the design an official tone. Inside, the photo frame features straight edges for a clean-cut style that helps recipients focus solely on the photo. Present any 5" x 7" portrait in style with a closable cover to shield against smudges, spills, and other mishaps. Lightweight paper stock is much easier to carry and store than a wood frame. Self-supporting panels display the photo in a decorative deckle cut frame. Imprint the border with commemorative type to help recipients quickly recall memories when showing off their photo. Both the left panel and covers are also customizable with your brand's name, logo, or other information. Dimension Closed: 6 1/2" x 8 1/2"
Dimension Open: 13" x 8 1/2"